This blog is dedicated to all Malaysian watch fans. Started as a hobby, this blog then started to give & share all informations that I gathered to all readers in Malay language. It's All About Watches - Dedicated coverage of new watches no matter the style, brand, or price! We aren't one of the fastest growing watch blogs for no reason. Come join us in our journey as we become one of the most widely read watch blogs out there. 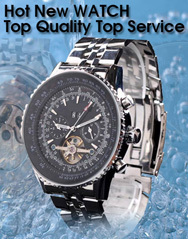 The Blog Of The Watches - Technical information, book reviews, innovation curiosity on the wristwatches. Axilleus Watches Blog - Hi to all! this is my new blog. I hope you enjoy it. Thanks to those who read it. The passion for watches is something extraordinarily, difficult to tell in person. It can only transmit.